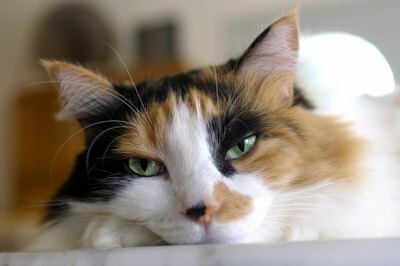 Dietary modifications can help a cat suffering from renal failure. A diagnosis of renal failure in your beloved pet does not have to mean doom and gloom. While renal failure is an incurable disease, dietary changes are successful at slowing the disease’s progression as well as improving your cat’s quality of life. There are foods made specifically for cats suffering from renal failure. These foods contain lower protein and phosphorus levels, compared to traditional cat foods. They also contain special vitamin and mineral supplements that cats with renal failure are lacking. If you decide to tackle a dietary change for your cat, there are a number of goals you'll likely accomplish. The specially formulated foods are capable of changing your cat’s blood chemistry levels. The main goal of a diet change is to return blood phosphorus levels to normal. You'll also likely reduce your cat's sodium, calcium, and parathyroid hormone levels, while at the same time increasing potassium, and vitamins B, C, and D levels. Cat foods designed specifically for renal diets have reduced levels of phosphorus and protein. There are many canned and dry formulas available from major makers, such as Eukanuba, Science Diet, and Purina. These foods have added supplements that aid in the treatment of cats with renal failure, so additional supplementation generally is not necessary. Making the diet change to a renal failure-friendly food does not have to be a difficult process. Cats with renal failure often do not have hefty appetites, and changing a picky eater’s diet might lead the cat to avoid eating altogether. If your cat refuses his new food, do not panic. Getting your cat to enjoy his new food might take a little bit of creativity. Heating the food, or mixing it with low-sodium chicken broth or another appealing ingredient might help stimulate kitty's desire to eat. Always consult a veterinarian before making any changes to your cat’s diet. Also, make sure that your cat always has plenty of fresh water. Since cats with renal failure are unable to conserve water, they must drink a lot of water each day to prevent dehydration. Do Cats Urinate Less When They Are on Kidney Foods?